"The High Priestess of Soul," Nina Simone in concert at Morlaix (Finistère, France) May 14, 1982. Photograph by Roland Godefroy. Eunice Kathleen Waymon, better known as Nina Simone (February 21, 1933 - April 21, 2003), was an American singer, songwriter, pianist, and civil rights activist. Although she disliked being categorized, Simone is generally classified as a jazz musician. Her work covers an eclectic variety of musical styles, such as jazz, soul, folk, R&B, gospel, and even pop music. Her vocal style is characterized by passion, breathiness, and tremolo. Simone recorded over 40 live and studio albums, the biggest body of her work being released between 1958 (when she made her debut with Little Girl Blue (Nina Simone album) and 1974. Songs she is best known for include My Baby Just Cares for Me, I Put A Spell On You, I Loves You Porgy, Feeling Good,, Sinnerman, and Nuff Said: Ain't got no-I got life. Nina Simone lifted jazz, blues, and rhythm and blues singing to a higher level with her ease at storytelling through musical notes and vibrant rhythm. She was able to go beyond ordinary music-making to relate to a greater frame of reference—to an ever expanding world fan and supporter base for this unique music. Simone made a difference and served the greater good in the world of music. Simone was born Eunice Kathleen Waymon in Tryon, North Carolina, one of eight children. From a baby she showed genuine love of music and as a very young child was noted for her spirited clapping, on beat at church! She began playing piano at her local church and showed prodigious talent on this instrument. Her concert debut, a piano recital, was made at the age of ten. During her performance, her parents, who had taken seats in the front row, were forced to move to the back of the hall to make way for white people. Simone refused to play until her parents were moved back. This incident contributed to her later involvement in the American Civil Rights Movement (1955-1968) movement. Simone's mother, Mary Kate Waymon (who lived into her late 90's) of African slaves, American Indian and Irish descent was a strict Methodist minister; her father, John Divine Waymon, descended from African slaves was a handyman and sometime barber who suffered bouts of ill-health. Mrs. Waymon worked as a maid and her employer, Mrs. Miller, hearing of Nina's talent, provided funds for piano lessons. A petite, silver-haired, bird-like English woman with a Russian painter husband became her tutor and subsequently, Miz Mizz Mazzy,(Nina's name for her) created a local fund to assist in Eunice's continued education. At age seventeen, Simone moved to Philadelphia, Pennsylvania, where she taught piano and accompanied singers to fund her own studying as a classical music pianist at New York City's Juilliard School of Music. With the help of a private tutor she studied for an interview to further study piano at the Curtis Institute, but she was rejected. Simone believed that this rejection was because she was a black woman and it fueled her hatred of the racial injustice in the United States. It seemed that her dream to become the first African-American classical pianist would not be fulfilled. Simone played at the Midtown Bar & Grill on Pacific Avenue in Atlantic City, New Jersey to fund her studying. The owner said that she would have to sing as well as play the piano in order to get the job. She took on the stagename "Nina Simone" in 1954 because she didn't want her mother to know that she was playing "the devil's music." "Nina" (meaning "little girl" in Spanish) was a nickname a boyfriend had given to her and "Simone" was after the French actress Simone Signoret, whom she had seen in the movie Casque d'or. Simone played and sang a mixture of jazz, blues and classical music at the bar, and by doing so she created a small but loyal fan base. After playing in small clubs she recorded a rendition of George Gershwin's "I Loves You Porgy" (from Porgy and Bess) in 1958, which was learned from a Billie Holiday album and performed as a favor to a friend. It became her only Billboard top 40 hit in the United States, and her debut album Little Girl Blue soon followed on Bethlehem Records. Simone would never benefit financially from the album, because she sold the rights for $ 3000. It meant that she missed out on more than 1 million dollars of royalties (mainly because of the successful re-release of "My Baby Just Cares for Me" in the 1980s). After the success of Little Girl Blue, Simone signed a contract with a bigger company under the label Colpix Records, followed by a string of studio and live albums (Simone, 1992; Brun-Lambert, 2006). Colpix relinquished all creative control, including the choice of material that would be recorded, to Nina in exchange for her signing with them. Simone, who at this point only performed pop music to make money to continue her classical music studies, was bold with her demand for control over her music because she was indifferent about having a recording contract. "It's like mass hypnosis. I use it all the time"
Many recordings exist of her concerts, expressing fragments of her on-stage power, wit, sensuality and occasional menace. Throughout most of her live and recording career she was accompanied by percussionist Leopoldo Flemming and guitarist and musical director Al Shackman. by Marcel Flaubert. 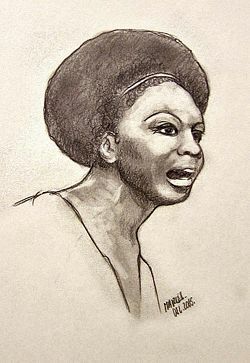 This drawing done in pencil on a4 paper depicts singer, pianist and civil rights activist Nina Simone in the mid- to late 1960s, the high-point of her commercial career. Her hair style (she was one of the first artists to publicly wear an afro) and emotive, slightly aggressive expression are illustrative of her character at the time. Simone was made aware of the severity of racial prejudice in America by her friends Langston Hughes, James Baldwin (writer), and Lorraine Hansberry (author of the play Raisin in the Sun). In 1964, she changed record labels, from the American Colpix Records to the Dutch Philips Records, which also meant a change in the contents of her recordings. Simone had always included songs in her repertoire that hinted to her African-American origins (such as "Brown Baby" and "Zungo" on Nina at the Village Gate in 1962). But on her debut album for Philips, Nina Simone In Concert (live recording, 1964), Simone for the first time openly addresses the racial inequality that was prevalent in the United States with the song "Mississippi Goddam." It was her response to the murder of Medgar Evers and the 16th Street Baptist Church bombing in Birmingham, Alabama, killing four black children. The song was released as a single, being boycotted in certain southern states. With "Old Jim Crow" on the same album she reacts to the Jim Crow Laws. From then onwards, the civil rights message was standard in Simone's recording repertoire, where it had already become a part of her live performances. She covered Billie Holiday's "Strange Fruit" on Pastel Blues (1965), which is a statement on the lynching of black men in the South, and sang the W. Cuney poem "Images" on Let It All Out (1966), talking about the absence of pride in the African-American woman. Simone wrote the song "Four Women" and sings it on the album Wild Is the Wind (1966). It is about four different stereotypes of African-American women. Simone again moved from Philips to RCA Victor Records in 1967. She sang "Backlash Blues," written by her friend Langston Hughes on her first RCA album, Nina Simone Sings The Blues (1967). On Silk & Soul (1967) she recorded Billy Taylor's "I Wish I Knew How It Would Feel to Be Free" and "Turning Point." The last song illustrates how white children would get indoctrinated with racism at an early age. The album Nuff Said (1968) contains live recordings from the Westbury Music Fair, April 7, 1968, three days after the murder of Dr. Martin Luther King. She dedicated the whole performance to him and sang "Why? (The King Of Love Is Dead)," a song written by her bass player directly after the news of Dr. King's death had reached them. Together with Langston Hughes, Simone turned the late Lorraine Hansberry's unfinished play "To Be Young, Gifted and Black" into a civil rights song. She performed it live on Black Gold (1970). A studio recording was released as a single, and the song became the official "National Anthem of Black America" and has been covered by Aretha Franklin on Young, Gifted and Black) (1972) and Donny Hathaway. Simone had a reputation in the music industry for being volatile and sometimes difficult to deal with, a characterization with which she strenuously took issue. In 1995, she reportedly shot and wounded her neighbor's son with a BB gun (pneumatic pistol) after his laughing disturbed her concentration. She also fired at a record company executive whom she accused of stealing royalties. In New York City, she was seen after finishing her set in a club performance, in the wee small hours, to demand her payment immediately, in a loud and angry voice, while exiting to her limosine. She gave the impression that people were taking advantage of her. It is now recognized that this 'difficulty' was not just the result of an over-exacting artistic rigor, but her raging outbursts and diva-like extremes were actually the result of a medical condition, possibly clinical depression or borderline personality disorder, for which Simone had to take medication. All this was only known to a small group of people around the singer for many years. The biography Break Down And Let It All Out, written by Sylvia Hampton and David Nathan revealed this secret in 2004. Simone impulsively left the United States in September 1970. The continuous performances and decline of the Civil Rights movement had exhausted her. She flew to Barbados, expecting her husband and manager, Andrew Stroud, to contact her when she had to perform again. However, Stroud interpreted Simone's sudden disappearance (and the fact that she left behind her wedding ring) as a cue for a divorce. As her manager, Stroud was also in charge of Simone's income. This meant that after their separation Simone had no knowledge about how her business was run, and what she was actually worth. Upon returning to the United States she also learned that there were serious problems with the tax authorities, causing her to go back to Barbados again. Simone stayed in Barbados for quite some time, and had a lengthy affair with the Prime Minister, Errol Barrow. A friend, singer Miriam Makeba, convinced her to come to Liberia. After that she lived in Switzerland and the Netherlands, before settling in France in 1992. Simone's divorce from her husband and manager can be seen as the end of her most successful years in the American music business, and the beginning of her (partially self-imposed) exile and estrangement from the world for the next two decades (Simone & Cleary, 1992; Brun-Lambert, 2006). After her last album for RCA Records, It Is Finished (1974), it was not until 1978 that Simone was convinced by CTI Records owner Creed Taylor to record another album, Baltimore. The album was not a commercial success, but did get good reviews and marked a quiet artistic renaissance in Simone's recording output. Her voice had not lost its power over the years, but developed an additional warmth and a vivacious maturity. Her choice of material retained its eclecticism, ranging from spiritual songs to Hall & Oates' "Rich Girl." Four years later Simone recorded Fodder On My Wings on a French label. It is one of her most personal albums, with nearly all of the autobiographical songs written by herself. In the 1980s Simone performed regularly at Ronnie Scott's jazz club in London. The album Live At Ronnie Scott's was recorded there in 1984. Though her onstage style could be somewhat haughty and aloof, in later years, Simone particularly seemed to enjoy engaging her audiences by recounting sometimes humorous anecdotes related to her career and music and soliciting requests. Her autobiography, I Put a Spell on You, was published in 1992. She recorded her last album A Single Woman in 1993. In 1993 Simone settled near Aix-en-Provence in the south of France. She had been ill with cancer for several years before she died in her sleep at her home in Carry-le-Rouet on April 21, 2003, aged 70. She left behind a daughter Lisa Celeste, now an actress/singer who took on the stage name Simone and has appeared on Broadway theater in Aida. On Human Kindness Day 1974 in Washington, DC more than 10,000 people paid tribute to Simone for her music and commitment to humanity. Simone received two honorary degrees in music and humanities from the University of Massachusetts and Malcolm X College. She preferred to be called "Dr. Nina Simone" after these honors were bestowed upon her. Only two days before her death, Simone was awarded with an honorary diploma by the Curtis Institute, the school that had turned her down at the start of her career. Simone had her first and biggest hit in America with a rendition of George Gershwin's "I Loves You Porgy," a track from her debut album Little Girl Blue (1958). It peaked at number 18 in the pop singles chart and number 2 on the black singles chart. In 1987, she experienced a resurgence in popularity when "My Baby Just Cares for Me" from the same album, became a hit all over Europe after it was featured in a Chanel no. 5 perfume commercial. A music video was then created by Aardman. Well-known songs from her Philips years include "Don't Let Me Be Misunderstood" on Broadway-Blues-Ballads (1964), "I Put a Spell on You," Ne Me Quitte Pas and "Feeling Good" on I Put A Spell On You (1965), "Lilac Wine" and "Wild Is the Wind" on Wild is the Wind (1966). "Feeling Good" was used in a Sky Movies advertisement, a 24 promotional advertisement, and in the drama series Six Feet Under (a promo for the fourth season). Several cover versions were made, most notably by British rock band Muse and Michael Bublé. It was sampled in a song by Mary J. Blige on her album The Breakthrough (2006). "Sinnerman" (from the 1965 album Pastel Blues) featured in the films The Thomas Crown Affair (1999), Cellular (2004), and Inland Empire (2006), an episode of the TV series Homicide - "Sins of the Father," an episode of the TV series Scrubs and on the soundtrack for the videogame Marc Ecko's Getting Up: Contents Under Pressure. Hip-hop producer Kanye West sampled "Sinnerman" for the Talib Kweli single "Get By." Talib Kweli also recorded a hip-hop remake of Four Women, which is featured on Reflection Eternal with DJ Hi-Tek. A remixed version by Felix da Housecat was used in the soundtrack of the film Miami Vice (2006). It was also covered by 16 Horsepower. Well-known songs from her RCA-Victor years include "House of the Rising Sun" on Nina Simone Sings The Blues (1967), "Ain't Got No - I Got Life," "Gin House Blues" and "Do What You Gotta Do" on Nuff Said (1968), the Bee Gees' "To Love Somebody" and Dylan's "The Times They Are A-Changin" and "I Shall Be Released" on To Love Somebody (1969). "Ain't Got No-I Got Life," a medley from the musical Hair, gave Simone a new and younger audience when it became a surprise hit, reaching number 2 in the UK charts in 1968. It has since become one of her most popular songs. It has been used in a television advertising campaign in the United Kingdom for Müller Dairy and returned to the UK Top 30 in a remixed version by Groovefinder in 2006. Simone had recorded the traditional song "House of the Rising Sun" in 1961 and it featured on Nina At The Village Gate (1962), predating versions by Dave Van Ronk, and Bob Dylan. It was picked up by The Animals and became their signature hit. They repeated this with a Simone cover of "Don't Let Me Be Misunderstood." "Don't Let Me Be Misunderstood" was also featured in the "J'adore Dior" perfume commercial. See also Civil Rights (1964-1974) in the Biography section for Simone's civil rights related songs. Nina Simone's music has featured in soundtracks of various motion pictures. Her music is frequently used in remixes, commercials and TV series. A lot of artists have covered Nina Simone's songs (or even her rendition of songs originally sung by other artists). Point of No Return (film) (1993), featuring "Here Comes The Sun," "I Want A Little Sugar In My Bowl," "Feeling Good," "Wild Is the Wind" and "Black Is The Color Of My True Love's Hair." Shallow Grave (1994), featuring "My Baby Just Cares for Me." Big Lebowski (1998), featuring a cover of Duke Ellington's "I Got It Bad And That Ain't Good." Billy's Hollywood Screen Kiss (1998) featuring "Love Me Or Leave Me." The Thomas Crown Affair (1999 film) (1999), featuring "Sinnerman." The Dancer Upstairs (film) (2002), featuring "Who Knows Where the Time Goes." Cellular (film) (2004), featuring a remix of "Sinnerman" by Felix da Housecat. Before Sunset (2004), "Just in Time" is an important part of the movies ending. Miami Vice (film) (2006), featuring a remix of "Sinnerman" by Felix da Housecat. Inland Empire (film) (2006), featuring "Sinnerman." The documentary Nina Simone: La Legende was made in the 1990s by French filmakers. It was based on her autobiography I Put A Spell On You and features live footage from different periods of Nina's career, interviews with friends and family, various interviews with Nina herself while she was living in the Netherlands, and on a trip to her birthplace. Plans for a Nina Simone biographical picture were released in 2005. The movie is based on Nina Simone's autobiography I Put A Spell On You (1992) and focuses on her relationship in later life with her assistant, Clifton Henderson, who died in 2006. TV writer Cynthia Mort (Will & Grace, Roseanne) is working on the script, and singer Mary J. Blige will take on the lead role. The movie is scheduled for 2007. "Who among us will avenge Ms. Nina Simone?" "My name is Neal Schon but people call me Nina Simone"
"I'm packing weight like Nina Simone piano flow"
"I send a rest in peace to Nina Simone"
"if not, then just let it be like Nina Simone"
"You're Nina Simone, when you talk on the phone." "And the whole world's in love with Simone"
"You may dig on the Rolling Stones, but they could never ever rock like Nina Simone." "I met a woman, Nina Simone, She taught me how to write"
"Last night I fell asleep in my home, had a little dream of Nina Simone"
Nina Simone was an extraordinary vocalist and storyteller who used her special talent to communicate with all peoples and especially the down-trodden and poor who were greatly affected by her energy and positiveness for life. Simone was constantly acclaimed and awarded with many achievements, certificates and prizes; yet, her singular power was her vibrant connection with her audience. In the album "Nina Simone and Piano!," she was able to record the songs which spoke about life, loneliness, death and reincarnation to give hope to her listeners that life was a relationship with a higher power and to be free of ego to attain a true self. "Jazz is a white term used to define Black people. My music is Black Classical Music." "You can see colors through music… Anything human can be felt through music, which means there is no limit to the creating that can be done… it's infinite. It's like God…you know?" "African-rooted classical music is what I play. I play Jazz and the Blues but they are not mine. The root is classical." "Music is one of the ways by which you can know everything that is going on in the world…. Through music you can become sad, joyful, loving… You can learn mathmatics, touch, pacing." ↑ Simone. I Put a Spell on You, pp. 26. ↑ Hampton. Break Down And Let It All Out, pp. 15. ↑ Brun-Lambert. Nina Simone, het tragische lot van een uitzonderlijke zangeres, pp. 56. ↑ Simone. I Put a Spell on You, pp. 48-52. ↑ Lords, Frank. Nina Simone, La Legende (documentary) [DVD]. France, United Kingdom: Quantum Leap. ↑ Simone. I Put a Spell on You, pp. 90-91. ↑ BBC Obituary: Nina Simone (2003-04-21). Retrieved 2006-12-07. ↑ Tim Sebastian (1999-03-25). BBC Hard Talk: Putting Music First. Retrieved 2006-12-07. ↑ Hampton. Break Down And Let It All Out, pp. 9-13. ↑ Simone. I Put a Spell on You, pp. 120-122. ↑ Simone. I Put a Spell on You, pp. 129-134. ↑ Brun-Lambert. Nina Simone, het tragische lot van een uitzonderlijke zangeres, pp. 231. ↑ Hampton. Break Down And Let It All Out, pp. 85. ↑ John Kelly. Answer Man: Kindness Turned Brutality. Retrieved 2007-01-05. ↑ Jody Kolodzey. Remembering Nina Simone. Retrieved 2006-12-07. ↑ Eric Hanson (2004). A Diva's Spell (pdf). Williams Alumni Review. Retrieved 2006-12-07. ↑ The Nina Simone Foundation. Retrieved 2006-12-07. ↑ Allmusic Guide: "I Loves You Porgy" Billboard chart position. Retrieved 2006-12-07. Feldstein, Ruth. "I Don't Trust You Anymore: Nina Simone, Culture, and Black Activism in the 1960s." Journal of American History, (91/4) 2005. Lords, Frank. Nina Simone, La Legende, (documentary), France; United Kingdom: Quantum Leap, 1992. Retrieved September 16, 2007. This page was last modified on 4 December 2018, at 18:00.